The Cooler Master MasterCase H500 has two sort of flattened screws to be removed to then lift up the tempered glass. These are fairly frustrating, considering they actually need a screwdriver to be able to get inside. To make any small changes to the interior means it requires a bit more effort. I will say they do look better. 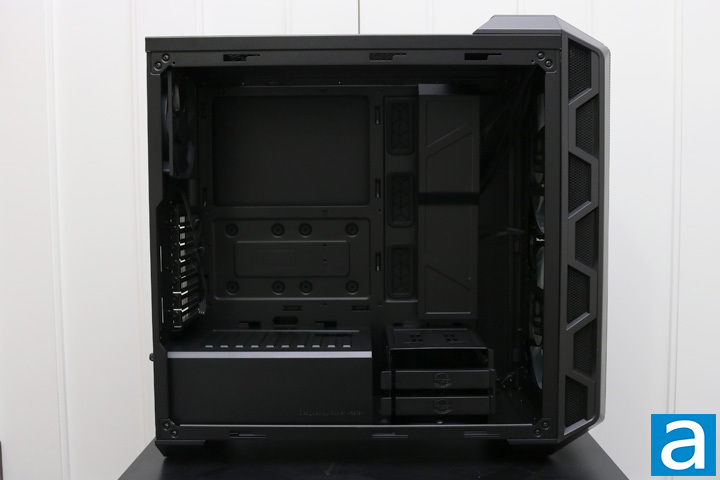 After getting inside, the MasterCase H500 continues its black color scheme. 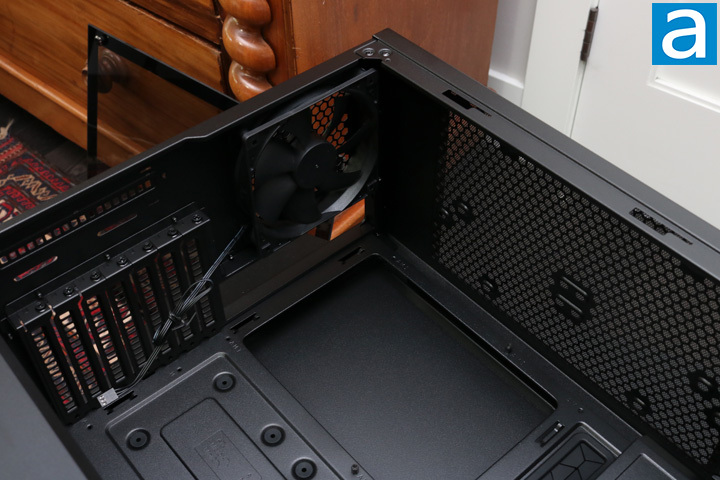 However, Cooler Master makes some changes to the traditional interior of a chassis. Typically, we see a power supply shroud covering almost the entirety of the bottom, only leaving some room for some cooling possibilities at the front. Cooler Master takes a decidedly different route. Reminiscent of the past, the MasterCase H500 opts for a reduced shroud with hard drive mounts found at the front. These hard drive bays are implemented unobtrusively, allowing for an entirely open intake while still leaving enough room for a radiator. In this area, we are able to install two 2.5''/3.5'' drives. Right above the hard drive cages, we find a covering keeping plenty of cables hidden. Towards the left of it, we find a couple of cable management holes with rubber grommets. 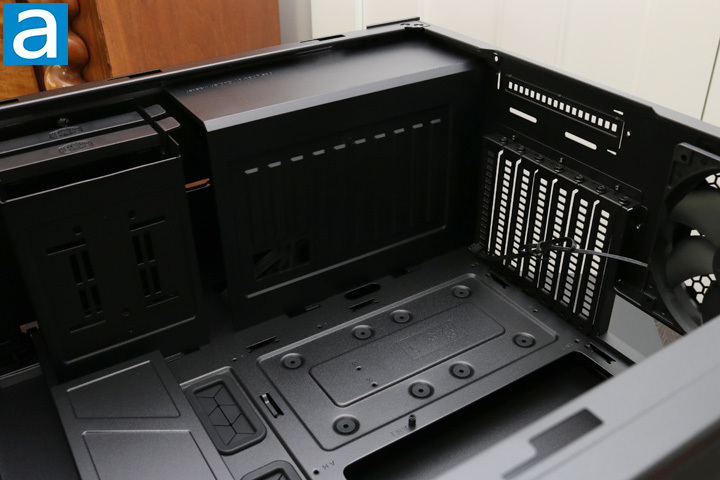 The cable management holes along the top are deftly hidden behind the motherboard tray, ensuring a clean final look. The motherboard tray area is not any different from other cases. The MasterCase H500 allows for ATX, Micro-ATX, and Mini-ITX motherboard sizes. Few of the standoffs are already installed, but Cooler Master includes the necessary components to do so easily. 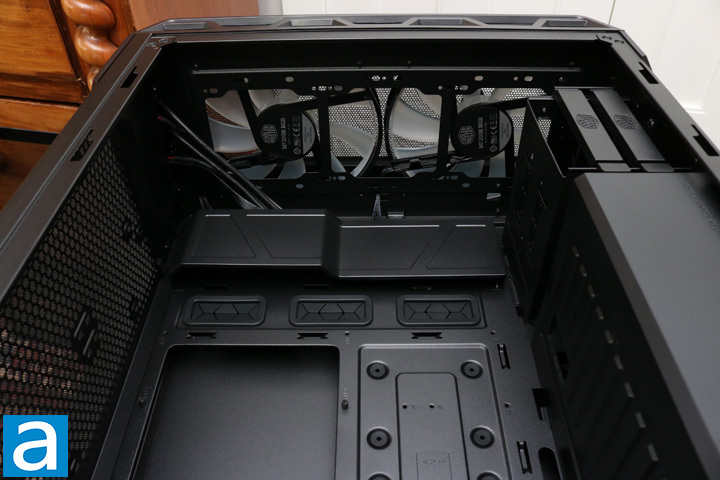 The opening is large enough to easily install a backplate for coolers. Air coolers can be up to 167 mm tall, which is a massive air cooler if one decides to opt for something so big. The MasterCase H500 also allows up to a single 200 mm fan installed along the top, two 140 mm fans, or two 120 mm fans. If you do decide to install fans along the top, just remember it will be fairly cramped up here. Cooler Master also includes a fairly fine dust filter to ensure a clean interior. Otherwise, the motherboard I/O is found in the same place as usual, with a 120 mm exhaust fan right next to it. A 120 mm fan looks laughably small in comparison to the massive 200 mm fans at the front. Seven expansion slots are located right underneath the exhaust fan. Here you are also able to see how these are slightly indented, with no locking mechanism. From this angle of the Cooler Master MasterCase H500, we can easily see the power supply shroud and the top of the drive cages. There is one larger cutout in the shroud for cable management and a couple more smaller ones for the tiny I/O connectors. The power supply cover is without any holes, creating an entirely separate temperature zone. Therefore, the power supply is independently cooled from the rest of the system. When it comes to installing the power supply, the entire shroud can be removed via a single thumbscrew on the back of the case. Otherwise, this is another good view of the expansion slots. One of the biggest benefits in creating a open interior for the chassis is that expansion components can now be much longer without other things like hard drive cages getting in the way. In the case of the Cooler Master MasterCase H500, there is enough room for a card up to 410 mm, which should really be enough for any graphics card. Cooler Master has definitely attempted to implement as much airflow as possible into the MasterCase H500. Two 200mm RGB fans are installed at the front for maximum air intake. These fans are ridiculously big, but at least guarantees excellent airflow throughout the system. These two fans are included, but if they are not to your liking, three 120mm fans or two 140mm fans can be installed. You can install up to a 360mm radiator at the front as well. The MasterCase H500 allows the user to customize by any cooling preference because of all these options. The dust filters at the front are installed into the mesh front of the one front panel and the small dust filters built into the side of the front. I am uncertain as to how good of a choice this is, because it makes cleaning the dust filter considerably more difficult than a removable filter. Be that as it may, the dust filter is fine and should keep the internals fairly clean. The back of the Cooler Master MasterCase H500 is nice and spacious for the most part. A power supply can be up to 180mm long, but that would leave limited room for cabling down there because of the hard drive cages. 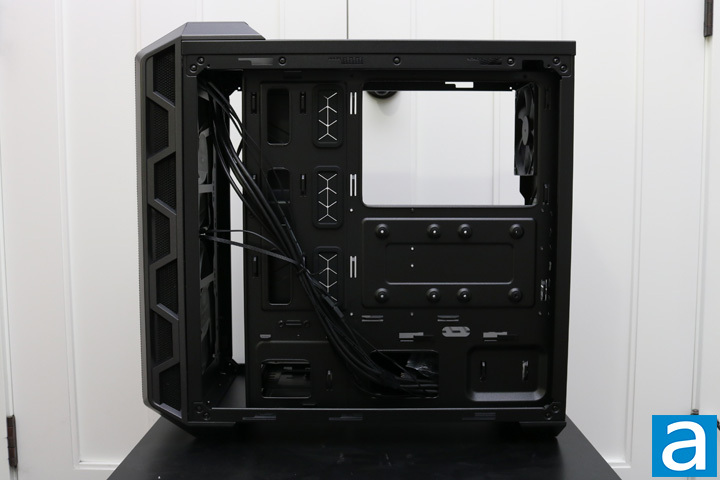 However, the MasterCase H500 has 30mm of room for cabling along the back, which is plenty. Considering all the front I/O connectors, it is excellent to have some more room along the back. There are plenty of cable tie loops to effectively tie down all the cables and have clean final look at the back. If you do not install a 360mm radiator, there is also some room at the front to lay a few cables. However, these will be visible through the tempered glass panel. The two RGB fans also have a controller that needs to be plugged in and powered via SATA. The internals are looking fairly promising, read on to find out how it was building in it!